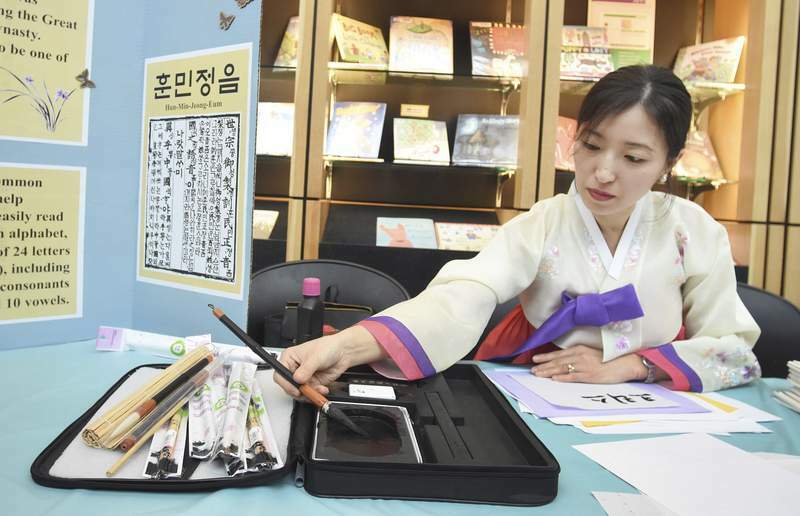 Rachel Von | The Journal Gazette Euna Park works Saturday on changing an English name phonetically to Korean during the Korea Festival at the downtown Allen County Public Library. Rachel Von | The Journal Gazette Visitors work on making traditional masks during Saturday’s Korea Festival at the downtown Allen County Public Library. Rachel Von | The Journal Gazette Guests enjoy checking out the Korea Festival at the downtown Allen County Public Library on Saturday September 8, 2018. The dresses looked like floating silk, soft colors sweeping the floor in wide skirts, topped with a loose-fitting blouse with a bow. 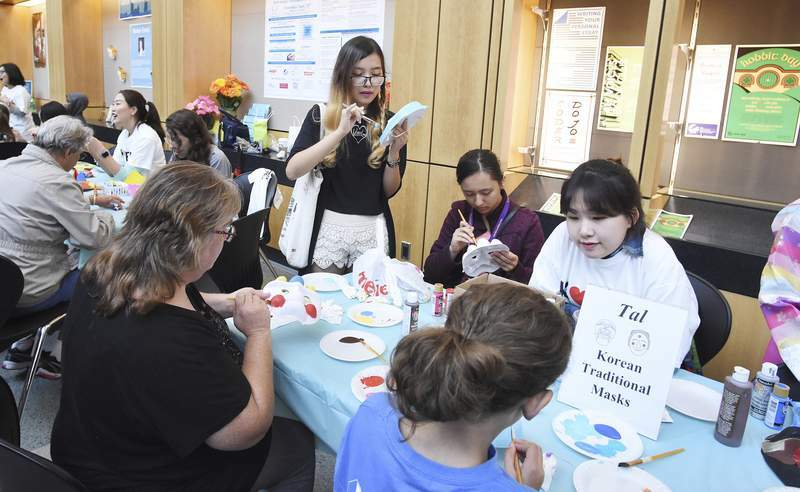 They were irresistible to many young women attending the second annual Korea Festival on Saturday at the downtown Allen County Public Library. They were allowed to try on the traditional Korean dresses – really skirts and tops – and pose for photos. The event drew between 1,300 and 1,500 people, said Sohie Shim-Tippman, community engagement director for the Korea Festival. One fan, Michelle Kivi, said she was introduced to K-Pop by a friend and the catchy pop music helped her get through a divorce. “I felt better,” Kivi said Saturday, waiting for the K-Pop & Dance Contest in the outside Plaza to start. After K-Pop, Kivi took Korean lessons at IPFW and attends Korean religious services at First Presbyterian Church downtown. She is a fan of Korean food and travels to places like Chicago, Detroit and Toronto with her friend to see K-Pop concerts, she said. Shim-Tippmann said even though the Korean community itself is small, about 300 people, interest in the Korean culture seems to be growing. Lily Hahn, 11, of Willshire, Ohio, just across the Indiana state line, discovered K-Pop when she was searching the internet for new, different music to listen to. That led to an interest in all things Korean. As her parents, Rick Hahn and Andi Boyer-Hahn, looked on, Lily, who said she hates wearing most dresses, wore the hanbok and loved it. “It's very light, sort of a floaty feeling and quite comfortable compared to a normal dress,” she said.